Today, we’re taking a look at classical guitars priced under $1000. At this price point, you’ll find a guitar that includes various tone woods and construction techniques to produce a high-quality instrument. The materials and methods of classical guitar construction may vary, but the typical shape is either modern classical guitar or the historic classical guitars of France and Italy. Let’s check out several guitars available under a $1000 and find one that is just right for you. How can you actually use this information? If I find these present, then it’s time to look further into the instrument and play it as well. If all checks out, someone’s going home with a nice guitar!! Our first review is for the Kremona Rosa Morena Flamenco guitar. Flamenco guitars are built lighter with thinner tops than classical guitars, which produces a brighter sound quality. Builders also use less internal bracing to keep the top more resonant to help produce the brighter and louder notes. Volume has traditionally been very important for flamenco guitarists. To increase volume, harder woods are used for the back and sides, with softer woods for the top. The Rosa Morena is crafted of Indian rosewood and European spruce. This Flamenco guitar delivers the rich, warm tone and dynamic range of a classical guitar but with subtle flamenco design elements and robust sound. This Kremona model features a solid top, ultra-thin gloss finish and a Honduras cedar neck. The Indian rosewood fingerboard and bridge, along with a bone nut and saddle compliments the other Flamenco features. Further nice touches include solid wood binding and sound hole rosette, gold tuning machines, and a traditional Flamenco tap plate. A Kremona padded gig bag with neck support is included, but a hard-shell case would be a definite plus. You can always add a better case later. The Rosa Morena is a decent consideration for under $1000. Next up is the Cordoba C9 Parlor. This classical instrument is a sweet, smaller guitar. It is ideal for the player looking for the feel, comfort, and ease of playability that a smaller instrument provides, while retaining the pleasant, warm tone created by solid wood construction. The C9 Parlor is built with a Canadian cedar top and solid mahogany back and sides. The C9 Parlor features a 7/8 body size, perfect for smaller players or those musicians preferring the slightly smaller instrument. That’s not all; other features include a 50mm nut width, and the fan bracing pattern used on most Cordoba guitars is also found here. Like every guitar in the Cordoba Luthier series, the C9 Parlor is built with Spanish heel construction, where the top of the guitar is attached to the neck. The sides are added next, and the guitar’s body is sealed by the addition of the back. This technique allows the entire instrument to vibrate as one unified piece. Aesthetic touches like the mother-of-pearl weave rosette, a premium rosewood fingerboard and rosewood bridge, and a high gloss finish are all noteworthy features. What’s more, the C9 Parlor includes Cordoba’s lightweight polyfoam case. This smaller, parlor-sized guitar is an outstanding candidate for less than $1000. The NCX1200R is a mix of classical and modern design. If you enjoy playing classical, but would like to add in other musical tastes, this may be the guitar for you. Why does this matter? Because you have an instrument that can give you a lot of playing options, and still allow you to return to classical guitar roots. The Yamaha NCX1200R classical guitar comes with a solid Sitka spruce top, solid rosewood back and sides and an African mahogany neck. Also included is an ebony fingerboard and a nice, natural finish. That’s not all; the A.R.T. 2-way pickup system will give you the option of playing solo or projecting with other instruments in an orchestra or band. The modern styled NCX1200R is designed with a thinner body and a narrower neck compared to traditional classical guitars. The cutaway is designed to provide greater comfort and playability for today’s classical players. 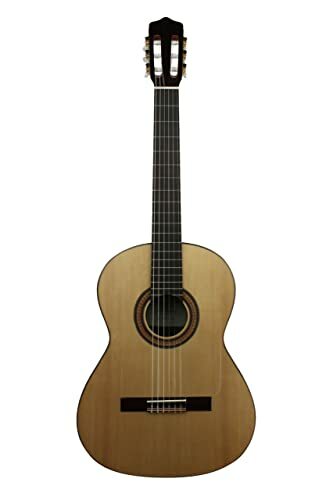 The 1200R is an instrument perfect for adding nylon string tones to a wide range of musical styles from Latin to Jazz, Pop to Rock, and Classical as well. Yamaha has added some really nice accessories to give you a total classical guitar package. The guitar comes with a reinforced case, guitar stand and the Yamaha Guitar Care Kit. Want more? How about an instructional DVD to help get you started with the Yamaha NCX1200R. The first thing that caught my eye was a classical guitar with rosewood TOP, back and sides. Immediately, this is not going to sound like a traditional classical guitar. Maybe with electronics it’s ok, but I would rather have a really nice guitar that I could play miked up or not. The Rose belongs to Cordoba’s Fusion series, a line of high-quality crossover or hybrid style nylon string guitars designed to play and feel like steel string acoustics. Most notably, the necks are carved thinner than traditional Spanish-style “classical” guitars and have a nut width of 48mm. The option of 12 or 14 frets to the body is a design choice left up to the individual player. The slimmer dimensions combined with a radiused fingerboard give the Fusion series the feel and playability that most steel string and electric guitar players are used to. The Fusion series models have all the warmth, body, and resonance that traditional “classical” nylon string guitars are known for and are built using traditional Spanish guitar methods like domed soundboards and fan bracing patterns in the design. Additional features include cutaway and non-cutaway body styles, Fishman or BBand pickups, 2-way adjustable truss rods, and Savarez Corum Alliance strings that offer the higher tension feel that most crossover players are looking for. The bridge, binding, and headstock overlay are made of Indian rosewood, and the rosette is hand inlaid using maple and rosewood rings. Included is a deluxe Cordoba gig bag. If you are looking for a traditional classical guitar, you’ll have to keep reading for other choices in today’s article. Verea’s silky cedar top with Indian rosewood back and sides deliver both a beautiful, sturdy bass and a responsive bite in the treble. This Kremona guitar has specifications that include solid back and sides, solid top, and a super-thin gloss finish. The Verea also comes with a Honduras cedar neck, an ebony fingerboard, along with bridge and dual headstock overlays. But there’s even more; a bone nut and saddle contribute to the best possible sound. Top off the ascetics with wood binding and a nice rosette. Playability is enhanced by a 650 mm scale length and a custom narrow 48mm neck width at the nut. Kremona Arete medium-high tension strings are included. Another great feature is the Dual-source Fishman Blend system pic-up. The Verea also comes with a sturdy gig bag for travel. Here’s another excellent choice for our Best Classical Guitar under $1000. Next up is the SLG200NW classical “silent” guitar. Your first thoughts may be, “who wants a silent guitar.” Most players want their instruments to project. What’s the big picture with the SLG200NW? Read on and we’ll look for any merits. The bodiless design of the SLG offers a natural, quiet sound that allows guitarists to play without disturbing others, whether practicing late at night or playing in the living room when the family is home. The SLG200NW is 80% quieter than an acoustic guitar. The SLG is the perfect instrument for practice, travel or stage use. The near-silent performance makes isolated practice simple. Quality on-board electronics enhance your playing, and line-in functionality makes jamming with other players easy. Yamaha’s exclusive SRT-Powered pickup system gives natural classical tone through headphones or line-out. The SRT Powered is a new system designed to recreate the body resonance of a classical guitar in a bodiless guitar. By actually reproducing the sound of a classical guitar, Yamaha lets players experience the genuine body resonance and tone of an acoustic guitar, while avoiding the need for a microphone when recording. The SRT Powered system can even be mixed with sound from the instrument’s pickups, allowing guitarists to capture their favorite music. Want even more? This Yamaha classical guitar has striking looks and a rosewood and maple framed full-size collapsible body. The detachable top section of SLG’s frame provides practicality and portability beyond that of a conventional guitar. The gig bag provided can be carried with ease and fits into an aircraft overhead compartment with room to spare. The SLG lets you play whenever and wherever inspiration hits. The SLG200NW takes a new twist on the traditional classical guitar line-up for less than $1000. Cordoba is featured again in today’s review with another excellent classical guitar. 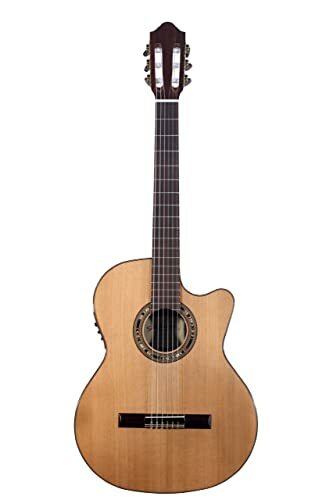 The C9/CD is one of the leading models in Cordoba’s Luthier series. Why does that matter? The completely handmade C9 features a solid Canadian cedar top with solid mahogany back and sides. Also included is a rosewood fingerboard, Indian rosewood bridge and binding, and a natural high gloss PU finish. Built in the style of historical maker Torres, the C9/CD comes with Spanish fan bracing and Spanish heel construction. The C9 has the neck shape and flat fingerboard characteristic of traditional classical guitars. The C9 also features the Luthier series’ signature rosette and a mother-of-pearl inlay inspired by a Domingo Esteso rosette from the 1920’s. The C9/CD has the standard classical 52 mm nut width and a 650 mm scale length. Savarez Cristal Corum strings and a Cordoba hard shell humidified case are excellent accessories. As with traditional classical guitars, the C9/CD is built lighter than steel string guitars, allowing the soundboard to vibrate and resonate more freely. The fan bracing pattern gives the center of the soundboard more surface area to vibrate and respond to the tension of the strings. A more responsive soundboard makes the guitar louder and provides better tone. Like all Cordoba guitars, the C9/CD comes equipped with a lightweight, two-way truss rod that allows you to adjust the amount of relief in the guitar’s neck. 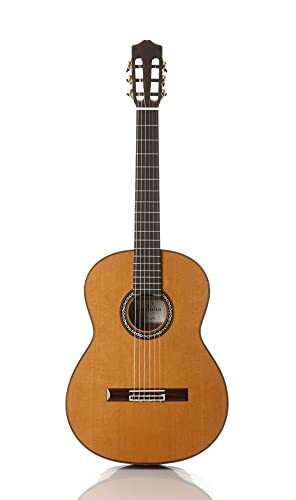 The Cordoba C9/CD is a perfect option in today’s classical guitar review for less than $1000. Classical Sound Meets Modern Technology; that’s an induction I am not fond of in our review of classical guitars. Let’s see what they have to offer. The Godin Multiac Nylon Encore Acoustic-Electric Guitar brings Multiac quality to a new price point for nylon string players. It features a two chambered silver leaf maple body with poplar wings and a solid cedar top that produces a warm and vibrant tone. The neck is wide enough for classical players yet slim and comfortable for electric guitarists as well. The Multiac Encore’s electronics are custom voiced, combining a sound imaging mic and an under-saddle transducer. A dual source pre-amp with volume, EQ, feedback control, and blend permits an infinite range of acoustic nylon tones. 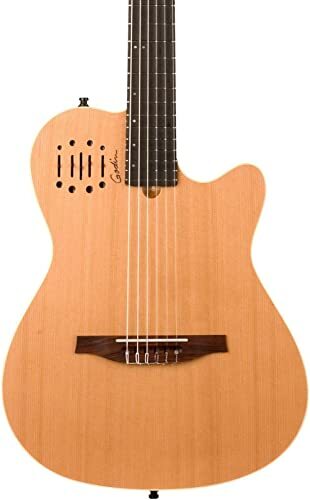 You can get that inimitable Godin Multiac nylon-string feel and sound in a high-quality guitar that won’t break the bank. Godin’s Multiac Encore acoustic-electric nylon-string guitar feels nice. There’s more…its thin line design and amazing pickup system make it your go-to live instrument. You get maximum control over your sound thanks to custom dual-source electronics system by EPM. This allows you to select between under-saddle and soundboard transducers. In addition, the solid tone woods on the Godin Multiac Encore give you the full sound you require. This guitar is touted as an amazing acoustic design for electrified live performance. It’s ok for that, but I would prefer a really nice classical guitar miked up for live performances. That way, you have a nice instrument for sessions with or without a mike being involved. seeing all of these guitars, it’s time to make a choice and get one in your hands. I’m selecting the Cordoba C9 CD/MH guitar as my choice today. Why? It has several things I’m looking for in a classical guitar; solid cedar top, wide fingerboard, high-gloss finish and a beautiful rosette. All for less than $1000. The C9 CD/MH is a fine classical guitar. 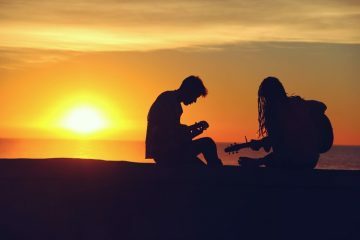 Play the guitar and enjoy its beautiful, warm tone. If you need electronics for amplification or recording, add that on stage or in the studio. If you’ve got a great guitar without electronics, you still have a great guitar when electronics are need for preforming or recording. To us, you really can’t go wrong with the Cordoba C9 CD/MH classical guitar. Next ArticleAlesis Recital Review – Is It Worth The Investment?